Perhaps the most basic institution of any community is the market. It has been a mainstay through generations of human culture. Over the years, they have reflected the changes in how humans eat and behave. The last 50 years witnessed the growth of supermarkets filling the needs of a culture moving to the suburbs and the dominance of warehouse grocers to fill big carts with low prices. In recent years, however, customers have realized the benefits of eating food from local markets. Coupled with the economic trend of the late 2000s, people have moved back to the city, and the local market has surged in popularity once again. According to a study conducted in June 2011, mass-merchandise retailers, such as Target and Walmart, are preferred by “millennials” (aged 16-34) almost as much as traditional grocery stores such as Kroger and Safeway: 32 percent to 34 percent respectively. Combining the popularity of new store formats with the leading demographic in digital consumption, for the 16- to 34-year-old, a better store experience becomes paramount. And whether they're shopping for oranges, steaks, magazines or clothing, an improved shopping experience that differentiates from the competition means a better bottom line. The evolution of technology has brought forward a new kind of consumer: the digital shopper who uses screens and engagement to make better decisions about spending money. An integrated digital network can foster and encourage that relationship and influence a shopper’s behavior. Done well, the result benefits both the shopper and the store. Customers still shop at the brick-and-mortar locations for one reason: because they can’t get fresh produce and quality meat online. So the store is still the focus. The store is the hub of the shopping experience, where companies will spend the money to create a better experience to attract and keep clientele. There are more than 36,000 supermarkets (with $2 million or more in annual sales) in the United States. Each has an average store size of 46,000 square feet. That’s 6 feet of grocery for every single person in the country. The supermarket industry is a $562 billion industry, yet the average profit margin is less than 2 cents on the dollar. Calling the industry competitive would be an understatement. Supermarkets succeed by volume sales, not price. So advertising’s goal is reach. But, consumers have moved away from the traditional channels of broadcast television, radio and newspapers; they are now online and in the digital world. So, supermarkets have followed. In-store advertising has matured, and product promotion has evolved into engaging communication. Now, shoppers can enjoy a 60- to 90-second video about a product, sometimes labeled “edutainment” as a source for information as well as promotion. Considering that 50 to 70 percent of purchase decisions are made in the store, a fact that is supported by end-caps as highly visual locations for promotion, it’s evident that content at the point of decision or purchase is more effective. The cutthroat nature of supermarket competition forces every organization to stay one step ahead. Supermarkets are similar to Google and Facebook. Using shopper loyalty cards to track customer purchases helps supermarkets better serve customer needs. For example, if shoppers buy a lot of potatoes, the store will stock potatoes at a competitive price. Mobile technology allows customers to control the buying process. From barcode scanner applications to QR code readers, customers can physically be in one store while shopping in another. QR codes have presented a new medium for supermarkets to offer specials to their shoppers. Placing a QR code at the point of purchase offers tremendous opportunity. A 2011 survey found that 53 percent of respondents use QR codes to get a coupon, discount or deal. The technology provides beneficial performance metrics. Using both mobile applications and interactive digital signage, the store can gather tremendous amounts of data on how shoppers navigate through the space, plus what is or is not selling, and leverage that data to create a better experience. The better store experience will result in higher volume sales, which is the key performance indicator for a positive return on the investment of an integrated digital media network. The goal with any marketing effort is to maximize the return on investment. Empty shelves are a wonderful problem to have. The empty shelf is by design; the right marketing mix of promotion and digital channels results in high product sales. Signage is designed to drive higher sales, but factors such as time of day, day of week, promoted item, season, campaign, content and location of the sign in the store affect the ability to sell the product. Static signage requires tremendous work to ensure the right sign is up at the right place at the right time, which can change by the hour. In contrast, digital signage allows stores to put all these factors into the content programming schedule so the display is automated, targeted and effective. Who Is Doing The Shopping? The recession in 2009 drove many men from the workplace to assume household duties, including grocery shopping. One report from GfK MRI and ESPN showed that 31 percent of men were the primary household shoppers in 2011, up from 14 percent in 1985. Another report from research firm DB5 said that 50 percent of shoppers were men. While numbers vary, it’s clear that the role of gender in shopping impacts how a supermarket caters to its clientele. Instead of markets built for the female shopper, both genders are likely to be in the store. This opens up opportunity for supermarkets to build new marketing and shopping experiences to a broader, tech-savvy audience. Proctor and Gamble has created “man aisles,” grouping men’s products into single locations that include TV screens to guide men through the products. When you combine more men doing the shopping with the number of channels available for information, it can be daunting to plan how to market to the shopper in the store. In 2011, an IBM survey that included more than 30,000 participants revealed that they use technology to start and stop their shopping experience, and nearly half the respondents reported they used two more technologies during the shopping event. Digital signage, as a medium, offers stores this opportunity. Shoppers enter the environment already armed with a wealth of knowledge about products. At this point, the shopper may want more information about a particular product or information on where it is located. One of the defining measures of supermarkets is that they are a mission-driven destination. Most people don’t go to supermarkets because they want to; they go because they have to, because that’s where the food is. Because of the nature of supermarkets, a tremendous amount of signage is ineffective; the shopper’s attention is focused on the mission, not the environment. In 2007, POPAI conducted research about marketing at retail. After performing their study in two convenience stores, a grocery store and a pharmacy, they discovered that shoppers are exposed to 1.5 pieces of marketing material every second, while engaging with only one piece every 4.3 seconds. The results showed that an astounding 84 percent of marketing material is ignored or filtered out. Further, it was discovered that temporary wall displays earned the lowest amount of exposure, at 1 percent. • The customer makes a better decision based on facts at the point of decision. • The store understands what shoppers want to know about products in categories as a way to offer a better experience. • Stores see what products move compared to products that don’t have digital signage or don’t have a lot of appeal. This affects what products stores are willing to carry to meet the demands of the shopper. From the time a shopper walks into the store until he leaves with bags in tow, the entire experience has the potential for digital engagement. An area of critical importance is the checkout line. One of the key reasons is wait time. Enter digital signage. In times of high traffic, when checkouts get clogged, digital signage can reduce the perceived waiting time by drawing attention away from the fact that the shopper is waiting and putting that attention on to a screen. This benefits the store in two ways. First, the store can leverage this opportunity to share information with the customer, potentially having a positive impression on the customer after he has left the store. Secondly, it reduces the perceived wait time, and the shopper maintains a positive opinion of the store, securing in his mind that it’s a great place to shop. This satisfies the goal to get and keep customers in the highly competitive race for the shopper’s dollar. Recently, many stores have moved toward the trend of providing locally grown produce. Shoppers and grocers are making a conscientious effort to cut down on the amount of time and distance it takes for a product to hit the shelves. 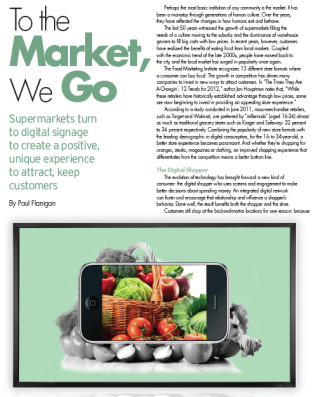 Digital media’s ability to change as often as the produce gives it a significant advantage over static signage, especially when market and environmental forces change a supermarket’s product offering. The result is advantageous for the grocer, in that costs may be reduced and greater profits are realized. Digital media can also play a big role in inventory. When products are diminished or out of stock, a network integrated with the store and chain POS system can respond instantaneously. The digital signage is updated, and the promotion for out-of-stock products is removed. The highly competitive $500-billion supermarket industry thrives on getting the right product in the right hands at the right moment. Supermarket chains around the world, from small regional chains to monster supercenters, are doing everything they can do find and keep loyal shoppers. The small profit margins demand that supermarkets stay as far ahead of the consumer and each other as possible, finding new ways to draw in the shopper. From new and unique foods, to non-food products, stores are evolving. The shopper is smarter and has more channels of information available than ever before. Smart supermarkets respect the time and effort shoppers put into product knowledge by leveraging digital media to complement that knowledge base, from prices to nutrition facts. Food, in particular perishable food, must move. Quickly. Or the store loses money. Instead of static signage that may only change after a few days, digital signage is relevant down to the hour of the day, when particular audiences are looking for particular items. 3. Drive up revenue while driving down costs. The supermarket industry sees some of the thinnest profit margins of any retail industry. Therefore, supermarkets must find every opportunity to reduce costs and drive revenue. Digital signage can eliminate costs found in traditional signage while steadily generating revenue due to the ability to offer multiple messages from a single and relevant location. By including digital signage in supermarkets, grocers can create a store that caters to a wider audience with high demands.